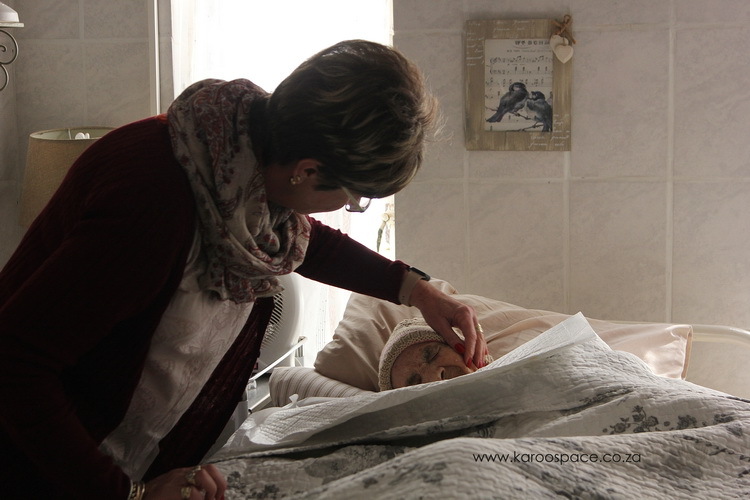 Ivonne Gentle of Britstown comforts and provides a safe sanctuary for the terminally ill.
Ivonne Gentle has been looking after dying dear ones since she was six years old, when the first of her three sisters passed away from cancer. 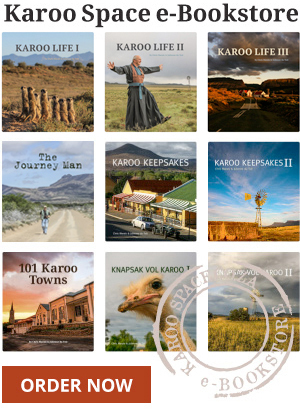 By the time her third sister succumbed in 2000, Ivonne and her husband Tommie had moved from Gauteng to the little Northern Cape settlement of Britstown. 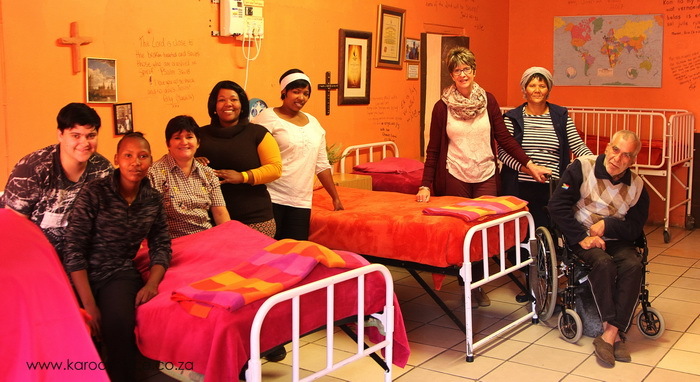 In her new community she was face-to-face with the sick, vulnerable and neglected. Ivonne Gentle, in a rare quiet moment. Ivonne went from door to door in Britstown, offering home-based care. Then she began to take patients into the family home, beginning with one terminally ill homeless woman. 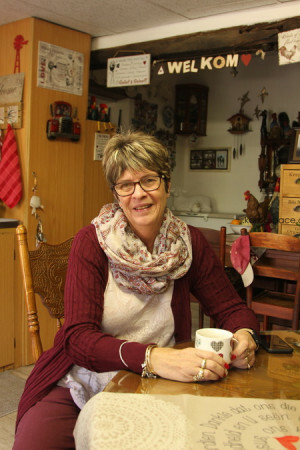 She and Tommie wound down their successful main road café business (which had seven small flats at the back of the property) and turned it into Gentlecare, currently offering sanctuary to 32 patients. What other people avoid, she seeks out. Ivonne confronts the worst humanity has to offer: cruelty, heartlessness, mindless suffering. Yet she remains undaunted and greets every moment with gratitude. Gentlecare is a place of last resort, funded by the UK-based Thomas family, local donors, churches, farmers’ wives and the sale of branded enamelware. The Gentlecare team of Britstown, with Frik and Asjas. Ivonne tells the harrowing stories of patients past and present in a respectful but matter-of-fact way. A young boy was found mistreating a tortoise and was pushed so violently he fell and broke his neck. He is now paralysed and has also lost a leg. A prisoner with 90% burns on him was dropped off at Gentlecare. As was a stroke victim, who arrived buck-naked. Two pre-teen boys with genetic defects including gigantism and severe autism (turned away by 62 other institutions) are here. A young man without a tongue was found in a burnt-out house in Kimberley and brought here. A farmer became a homeless wanderer, was involved in a very bad accident and now has a brain tumour and a bed at Gentlecare. 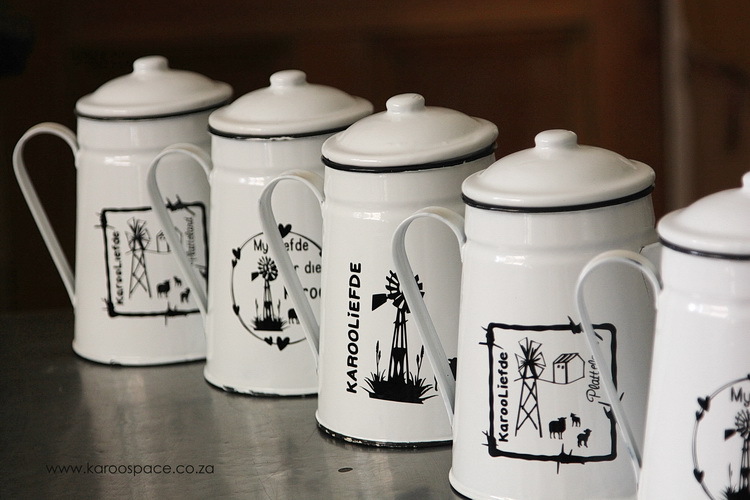 Part of Gentlecare’s funds come from the sale of branded enamelware, sold at certain padstalle. She draws her strength from the Bible, Mother Teresa and prayer. She holds onto her sanity by crocheting intricate doilies, the more difficult the better. Frik and Asjas – a happy ending. And of course, there are heart-warming stories, like that of an old man called Frik, who dropped to the pavement with a stroke one day. 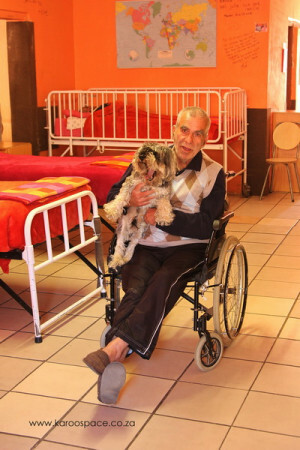 He was taken to Boksburg’s provincial hospital without contact details or ID documents on him. He was a man lost. Somehow, in one of the many miracles that seem to kick in whenever Ivonne really needs one, a friend was able to find and bring Frik to Britstown. Physically, he improved. But mentally, “he just wasn’t working with us,” says Ivonne. One day, he mumbled something about how he missed “his child”. It turned out that the child was his dog. Someone managed to find a lift to Britstown for the dog, which was being cared for by neighbours. He was a moody Schnauzer called Asjas. Gentlecare is on Britstown’s main road, opposite the lovely Transkaroo Country Lodge Hotel. Wow – what an amazing story. How blessed is she. God Bless this project, all involved and especially Ivonne and her family. This is incredibly beautiful, thank you for sharing, I needed this! Leave a Reply to Stella Hoon (Cilliers) Click here to cancel reply.